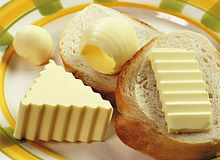 ^ Bring back butter conditioners. Retrieved 27 November 2005. The feature has been phased out for energy conservation reasons. ^ According to joyofbaking.com 互联网档案馆的存檔，存档日期2006-06-23., unsalted butter can last for up to three months and salted butter up to five. ^ Data from nutritiondata.com. Retrieved 27 November 2005. ^ 【消委會】人造牛油與牛油　兩者如何選？營養師「兩害取其輕」. HK01. [2019-01-20]. ^ Q&A about Saturated Fat, Trans Fat, and Cholesterol 互联网档案馆的存檔，存档日期2006-05-13. from the （U.S.） National Heart, Lung and Blood Institute （2005）. Retrieved 15 April 2006. ^ From data here。one teaspoon of butter contains grams of lactose; a cup of milk contains 400 times that amount. ^ Allergy Society of South Africa. Milk Allergy & Intolerance 互联网档案馆的存檔，存档日期2005-11-26.. Retrieved 27 November 2005. McGee, Harold. On Food and Cooking (Revised Edition). Scribner. 2004. ISBN 978-0-684-80001-1. pp 33-39, "Butter and Margarine"
Dalby, Andrew (2003). Food in the Ancient World from A to Z[永久失效連結], 65. Google Print. ISBN 978-0-415-23259-3 (accessed November 16, 2005). Also available in print from Routledge (UK). Michael Douma (editor). WebExhibits' Butter pages. Retrieved November 21, 2005. Gutiérrez Heredia, Ana; Benitez Ramírez, José. 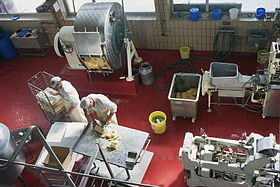 Elaboración de mantequilla. IC Editorial. 2013. ISBN 978-8-415-88622-8. Grigg, David B. (Nov 7, 1974). The Agricultural Systems of the World: An Evolutionary Approach, 196-198. Google Print. ISBN 978-0-521-09843-4 (accessed November 28, 2005). Also available in print from Cambridge University Press.